Welcome one and all to what will hopefully be a long a prosperous career as I attempt to tackle Dafuge's ever popular challenge. 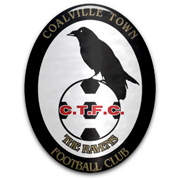 In a nutshell the challenge involves holidaying for a season and taking over one of the teams who is promoted into the lowest playable division of your chosen country, I chose England and was pleasantly surprised when Coalville Town were one of my options, I work in Coalville in Leicestershire so it was a no brainier for me. The intial squad I have inherited from former boss Tommy Brookbanks is still by en-large semi-pro, meaning their contracts are not protected, I have a wage budget of £3.5k so I have money to sign a few down but not everyone so I'll have to think carefully about who should be offered deals and who I'm prepared to risk losing. The Ravens play in the 2000 capacity Owen Street Sports Ground (Not the catchiest name in the world I know) both their training and youth facilities are in dire need of upgrades as they are both poor, It will be one of my foremost priorities to get these improved as they are vital if the club is to grow, establish itself at this level and eventually advance beyond to begin fulfilling my dream of a place in the football league. Best of luck with this, @Rick87! It's certainly a big challenge. I've decided to re-start this save, the time restraints applied by working a full time job and sharing in the parenting duties of my one year old daughter, have given me very little time to get into a game on FM17 but I now have a bit of time off (From the work part at least!) and I fancied re-starting this challenge. I had the save backed up so all the information in my opening post is till accurate and there is no need for me to make a new thread. I did an initial assessment of the squad left to me by my predecessor Tony Brookbanks and identified the key positions we need to strengthen this summer as leftback and central midfield as there is very little competition in these areas. A new first choice keeper wouldn't go a miss if my wage budget permits afterwards. I terminated the contract of one of my coaches Steve Walker as the board wasn't happy with the amount of coaches at the club currently, besides which he wasn't up to the standard of coaching which I wish to set during my regime. The Leics/Staffs cup is, as the name may suggest, a friendly competition with two clubs from Leicestershire (Us & Loughborugh Dynamo) and two clubs from just across the county boarder in Staffordshire (Burton Albion & Tamworth) We drew Loughborough in the semi final and I'm hoping for to advance to face Burton in the final as a tie with the League One side would be a real money spinner for us. Initially I have set up the team tactics defensively, we are predicted to come last for good reason and to have any hope of survival we must keep things tight, I am starting off with a cautious 4-5-1 with two wingers in advanced positions so we can counter quickly. All of the defenders have been limited in their duties and the full backs told to stay narrow in order to keep things compact and difficult to break down. As the season progresses I will make subtle changes to individual instructions to aid with creativity but for now let's focus on not getting beaten. Welcome back, @Rick87! No need to worry, life is more important of course.